If you get into the vehicle while you are on the phone, the call can be automatically transferred to HFL. 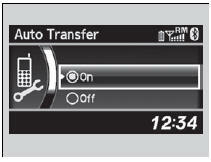 - Repeat the procedure to select Auto Transfer. 3. Rotate to select On, then press .